What is Forest School and the ethos behind it? that will enable continued and creative engagement with their peers and their potential. children are in the outdoors. that speak of our deep relationship with trees and woodland through the ages. activity and all the mental and physical development that the journey entails, in a safe, respectful manner. years professionals from the UK. play and learning can have a huge impact on the normal development of children. they have fewer days off sick; are more able to concentrate and have better co-ordination than the city kindergarten children. greater ability to work in groups, and generally children had high self-esteem and confidence in their own capabilities. of £1000m per place and is easily a full years commitment to complete all the assessments, portfolio and other work. such as John Muir & Duke of Edinburgh. 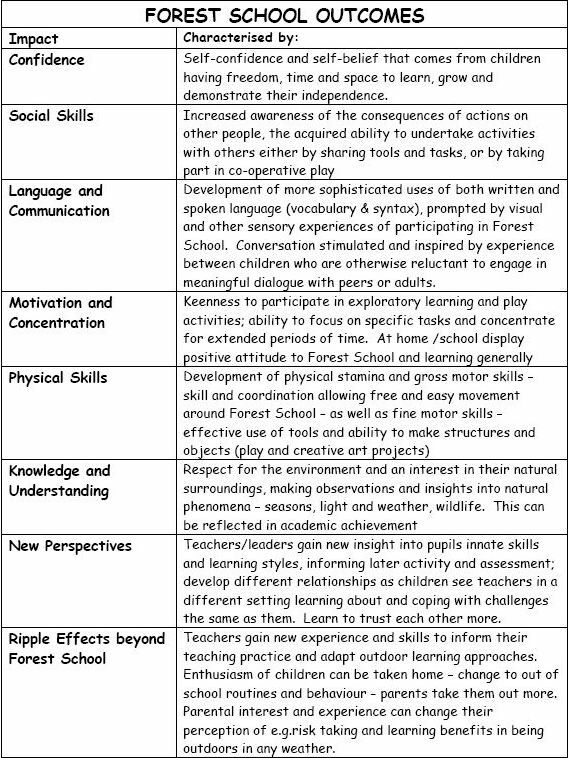 Forest School is much much more in terms of commitment, work & outcomes. the places would be filled by people living and / or working in Ayrshire. to include parents, teachers, group leaders and others. Arran as we could possibly think of including individuals, conservation groups, ranger services and work contacts. Word of mouth was also very useful and we had many enquiries from further afield. initial interest shown by local schools towards level 1. With this, we had the confidence to go ahead and arrange the courses. be learner led. It is as important for the development of the leader as well as the individual. this importance with local support of the development of Forest Schools too. come close to the complexity of Forest School. They are there to be complimentary to Forest School. Forest School is a way of working with people, using the outdoors, to develop self confidence, resilience and social/soft skills. The process is considered to be more important than the outcome and the experiences are often learner led. They should be flexible and subject to change and adapt as and when required. social and curriculum outcomes to be met in a way that traditional environmental education rarely does. Forest School is long term and learner led, Environmental Education is generally short term and task led. group, session & individual reports. Once the group session is complete, there is still much work to be done for the leader. assessments, species guides, emergency procedures and governing policies**. Quote and summaries from recent participants will appear here. 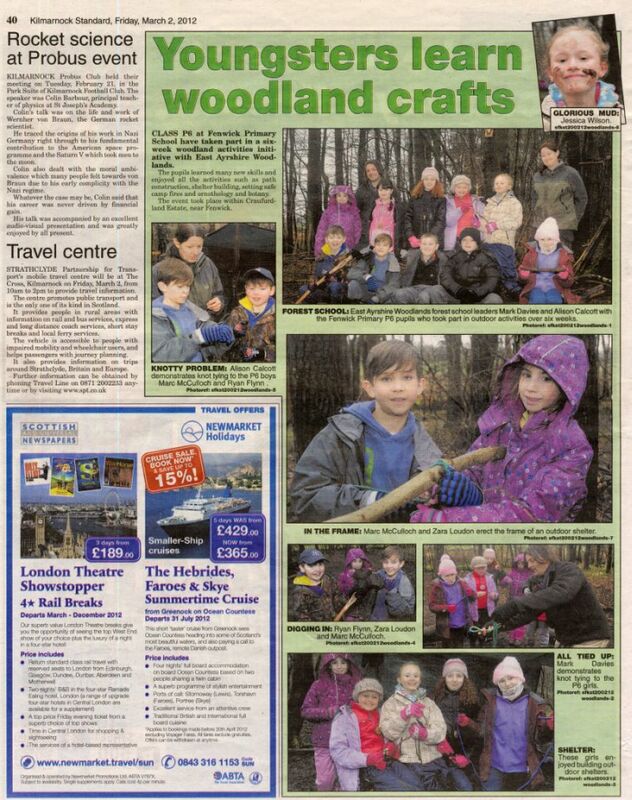 "I have learnt a great deal since starting our forest school sessions with p6. then seeing a child's confidence soar through their own achievement. We are there to guide....oh and of course to have fun." after a session and this quickly becomes second nature in other aspects of education work"
Interested in a Forest School? that wherever you are based, there will be a suitable site and qualified leader available.